You could easily spend 48 hours just in the temples of Angkor, but if time is limited, here are the main highlights. “Rediscovered” in 1860 by the French, this ancient capital is a true architectural marvel built during the 9th-15th centuries. Get an early start to catch sunrise at the main temple: Angkor Wat. This photogenic site is quite popular with tourists jostling for the best spots to catch the magic light of morning, with many choosing the front side from across the baray pools. Return to your hotel for breakfast, or grab something local nearby. This photogenic temple has been reclaimed by nature and is known for huge trees growing from the temple’s masonry. This location was also used in the original “Tomb Raider” film. Located a little farther away from other temples, this site has very elaborate carvings done in red sandstone which lights up to a dazzling pink in the late afternoon. This temple is often called a masterpiece of Khmer art! The final center of the Angkor Empire, this site houses the impressive Bayon, emblazoned with peaceful smiling face of King Jayavarman VII, as well as a number of stories depicted in bas relief. Cambodia has a great tradition of oral storytelling. 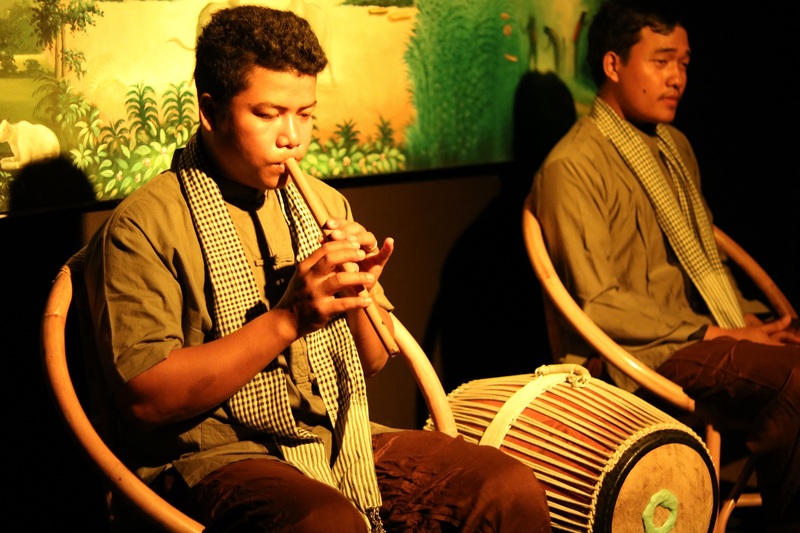 Visit this theater for a passionate 45 minute retelling of some Khmer myths in English, accompanied by traditional instruments. Drinks are also available inside to replenish your spirits as you grow captivated with theirs! The vibrant center of nightlife in Siem Reap is full of bars, restaurants, and people watching opportunities. All manner of budgets, tastes, and cuisines are available here ranging from local Khmer, all the way to fine dining. Freshwater fish are one of the main foods of the Khmer people, which come from the Tonle Sap Lake. It is unusual in that it quadruples in size during the rainy season. As a result, the fisherfolk that live here build their houses on very high stilts, in order to accommodate the annual flooding. Also in the lake are villages of houseboats of ethnic Vietnamese fishermen who live together with their families as though they were on land. Get a deeper understanding of the history surrounding the incredible monuments and the empire that flourished here. Learn about the civilization and heritage through informative displays of artifacts and multimedia presentations. The building’s air conditioning is also a great respite from the tropical heat! Founded in the 1990s, Artisans Angkor is a renowned social enterprise helping Khmer people gain skills and jobs in the arts. This workshop and gallery allows you to see local artisans doing what they love. You will come away with a new appreciation for the art and intricacy of Khmer techniques including silk weaving, sculpture, lacquerware, and jewelry. An excellent stop for a souvenir or two! Fusing the best of contemporary dance with acrobatics and Cambodian culture, this troupe of graceful athletes began as survivors of refugee camps and trained in performing and visual arts. The shows are all scripted, scored, and choreographed by the students and teachers themselves. Prepare for a physically and emotionally powerful evening of entertainment where movement is a universal language.